Sacajawea statue near Fort Washakie, Wyoming. One of the most famous women in American history, Sacajawea guided Lewis and Clark as they made their voyage across North America. She lies buried among her people at Sacajawea’s Cemetery on the Wind River Indian Reservation in Fort Washakie. Before Sacajawea, before the Europeans arrived in North America, the Plains Indians danced to honor tribal members, mark important events, or to seek protection for their people. Native Americans still dance for many of these reasons, and to keep their cultures and traditions alive. Attend a powwow to learn even more about the history and the modern-day lives of Wyoming’s Native Americans. See Eastern Shoshone culture and history through artifacts, artwork, photographs and treaties. Uncover the legend of Sacajawea and learn about Chief Washakie. Located at the east end of Fort Washakie Elementary School, 90 Ethete Road. Open daily from 8-4:45. Closed during lunch. From the Shoshone Tribal Service Station on the corner of Hwy. 287 and North Fork Road, turn towards the mountains (west) and bear left onto South Fork Road to Cemetery Lane. You will see the cemetery to your right. 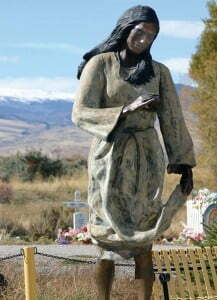 Include Sacajawea’s cemetery on your Wind River Indian Reservation Driving Tour. I almost blew by the small brown sign on the highway in Ft. Washakie pointing to Sacajawea’s grave. In fact, I’d flown by it countless times and never thought much about it. Finally one day I turned. From the dust and muted colors of the prairie there was a burst of color on the hillside. I swung the car down the road. A blaze of vibrant colors from silk flowers amid rows of jumbled crosses rising from the grass greeted me. I hadn’t even pulled into the gates and I already knew my search was worth it. Sacajawea Cemetery is named for the monument to the famous woman who joined Lewis and Clark’s expedition. But the cemetery itself is a cultural experience. It is here you can see the blending of Native American culture and Christianity. Large crosses mark most of the graves, some are white with names of the deceased, others stand out with unique designs painted on the wood. All the graves are adorned with boldly colored flowers that sit atop mounds of red dirt. This is an actual cemetery so I was conscious of being respectful as I wandered the coiling dirt paths among the headstones and crosses, reading the names and thinking about their stories. I could have easily lost time wandering and headed home satisfied with my outing, but I couldn’t come and not learn something about Sacajawea. A statue of her sits at the top of the cemetery, capturing the moment she first saw the Pacific Ocean. Her dress is blowing in the wind and in her hand she holds a sand dollar, representing the one she gave to Chief Washakie. At her feet lie coins, flowers and stones left by visitors. The plaque reads Sacajawea is believed to be buried somewhere in the Wind River Mountains west of the site. But it is here, at the cemetery, that people come to honor her. Sacajawea was born in what is now Idaho, but was kidnapped when she was 12 years old by Hidatsa Indians and taken to a village in what is now North Dakota. There, a French fur trapper bought her and made her his wife. Sacajawea was 16 years old and pregnant when the Lewis and Clark expedition made its camp near the village in which she lived in the winter of 1804. The captains hired her husband as an interpreter – he spoke Hidatsa and French. They asked Sacajawea to join them when they learned she spoke Shoshone. They thought she‘d be helpful in trading with the Shoshone, could act an interpreter and put tribes at ease because no war party would travel with a woman and an infant.